The table set for afternoon tea. I managed to collect just enough raspberries this year for one pie. The bushes gave up their last raspberries on Friday, so I decided I better get baking or I would not be able to interpret the fact that I actually had raspberries for a pie. 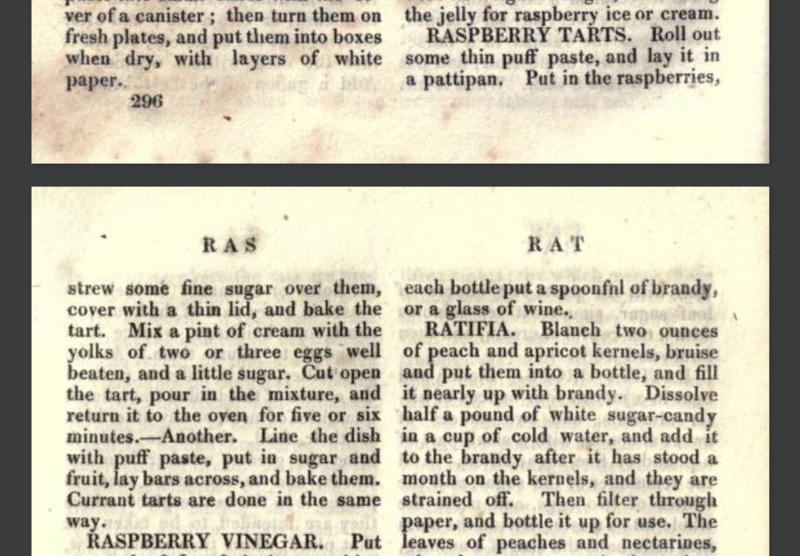 This excerpt shows the two basic kinds of raspberry tarts of the time. I decided to go with the second option, a straight up raspberry tart with a lattice crust. I used my standard pie crust recipe. This was my first ever lattice crust and it probably shows. I had not realised before that a lattice crust takes exactly the same amount of crust as a regular top crust, just in a different configuration. I suppose if I had thought about it, I may have twigged. I think I will do smaller bars next time as it looks a bit clunky to me. I put the bake kettle on my favourite spot on the hearth, but as this pie shows, there is a high spot on one side and the filling spilled over on part of the pie. My guests were too polite to notice, I am sure. Cut lard into flour with two knives until things are not getting smaller. Rub quickly and lightly to the consistency of breadcrumbs. Beat the egg add water to make up to 3/4 cup. Use enough of the egg/water to make a rollable dough (usually about half). Put in 1/2 of the raspberries into a bottom crust, add sugar, then the rest of the raspberries. Make a lattice top by slitting the top crust, then lay every other slat in place on top of the raspberries. Fold back every other slat and put the cross piece on, fold the slats back in place. Fold up the other slats and put the next piece on, etc. This entry was posted in historic cooking, Living history and tagged hearth cooking, historic cooking, Living history, open hearth, raspberry pie, Upper Canada Village on August 6, 2017 by gillianknitter.